(CNN) -- In just four days, Chris Picco went from husband and expectant father to a man without a family. His wife Ashley died November 8; their newborn son, delivered by emergency cesarean section, died three days later. In August, Ashley and Chris Picco celebrated their seventh wedding anniversary by posting a photo to Facebook. In the image, a tiny pair of fur-lined baby booties stands empty between the Southern California couple. "Coming Soon" is inscribed above. It is still Ashley's cover photo. Ashley was a mother for only a few short hours before she died. She left behind "harmonies that will continue to resonate in our hearts and memories," her family and friends posted online. Lennon James was born by emergency C-section three months early, "fighting for his life," Chris posted. Although Chris was grieving Ashley's loss, he thanked those who had reached out in several online postings. "It's impossible to sum up what has happened in the past couple of days," he said. "My wife, best friend and mother of my child passed away. I have a lifetime to grieve this unspeakable loss, but I know that right now she would want me to focus completely on baby Lennon James Picco..."
On Wednesday, a friend posted a video of Chris in the hospital, singing to his newborn son. 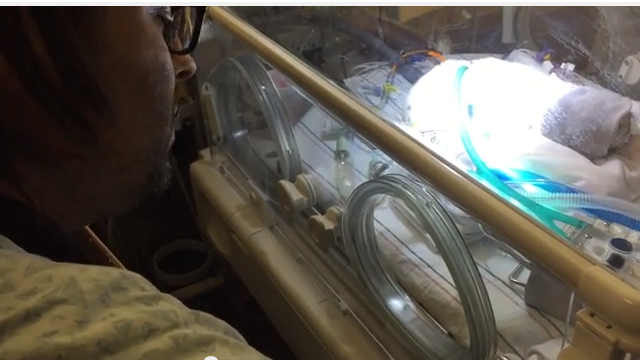 The video shows Chris seated next to a whirring, clicking incubator, baby Lennon swaddled in blankets and surrounded by tubes. The video was recorded Tuesday, when Chris had posted, "Ashley would often feel Lennon moving to music, so I brought my guitar today and gave him a little concert." The song Chris chose, "Blackbird," was written by John Lennon and Paul McCartney during their time with the Beatles. Little Lennon James Pico died late Tuesday night in his father's arms. "Dear friends, family, and supporters; it is with an unbelievably heavy heart that I write this. My little fighter, Lennon James Picco went to sleep in his daddy's arms late last night. He was surrounded by family, friends, and the best doctors, nurses and hospital staff in the world. He was dressed in an outfit that Ashley bought for him, with little guitars on it, and wrapped in a blanket made by a dear friend. I am so thankful for the four unforgettable days I got to spend with him. His mommy would have been so beyond joy to see him and to hold him, touch him, bathe him, sing to him - as I have had the privilege of doing. I have been so blessed and honored to love him before he was formed, to cherish him while mommy carried him, meet him face to precious face, and hold his perfect little body while we said 'goodbye for now'. There are no words, but I wanted to keep you updated, as your love and support has meant more than anything in the world. All you need is love." A spokesman for Chris said he wants to tell his story but needed time with family and friends for now. A memorial is planned for Saturday at the Piccos' church, Loma Linda University Church in Loma Linda, California.